Any time the forecast calls for a snowstorm, people tend to panic. By taking some simple steps in advance, you can ride out the next major snowstorm in safety and comfort without fighting crowds and rushing around. Make sure you have all the supplies your family will need for the duration of the blizzard and a few days more as soon as you hear about the storm. Include necessities like prescription and over the counter medications, pet food, and diapers. Pick up a few snacks and baking supplies; if everyone is snowed in and there’s power, why not make cookies? Have plenty of snow related supplies handy, like salt for icy sidewalks, shovels, sand, firewood if you have a fireplace, and blankets. 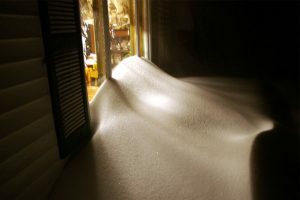 Keep the shovels and firewood just outside the door; you may have seen photos of people opening their front doors only to find themselves blocked in by snow! Pick up any items in the yard, such as holiday decorations, toys, and tools. If these items are covered by three feet of snow, you might not see them again until spring. Check weather-stripping and caulking for cracks or leaks. If the power goes out, it’s important to keep the heat inside and the cold outside as much as possible. Plastic insulation kits are an easy, inexpensive, and fast way to take care of any air leaks you may find around windows. Insulate pipes to make sure they won’t crack or burst during an extended power outage. Have the fireplace swept before the storm if you haven’t used it this season. There’s never a good time for a fire, but a fire during a blizzard is misery on top of disaster. Brush off any snow on the roof, if possible, before the storm brings more. Those light flakes can build up and cause roofs to collapse. One important step that you should not forget is to form an emergency communications plan in case your family is not all home when a storm hits. Everyone in your family should know how to contact each other in case of an emergency and it is also a good idea to establish a meeting place for after the storm. You must have this plan worked out with your family before an emergency and by keeping track of weather updates, you can decide when it is appropriate to put this plan into action. If you find water damage in your home in Northbrook, Wilmette, Glenview, Highland Park, Lake Forest, Winnetka, Buffalo Grove, IL and surrounding areas, call the trained experts at ServiceMaster DAK. We’re on call 24 hours a day, 7 days a week to stop water damage and begin the restoration process. Our IICRC (Institute of Inspection, Cleaning and Restoration Certification) certified technicians can manage any water damage resulting from damaged sump pumps, sewer backups, hot water heater leaks, or frozen or burst pipes.